Soy and citrus with salmon is such a great flavor combination. We hope you enjoy this gorgeous \\\\\\\\\\\\\\\"budget gourmet\\\\\\\\\\\\\\\" meal! Slice the orange into thin strips, to add on top of salmon. Cut salmon fillet(s) into 4 pieces each. Place in small baking dish and season with salt and pepper. In a small mixing bowl, combine the orange marmalade, lime juice, soy sauce, rice wine vinegar, and minced garlic. Spread directly onto the salmon fillets. Add the orange slices on top. 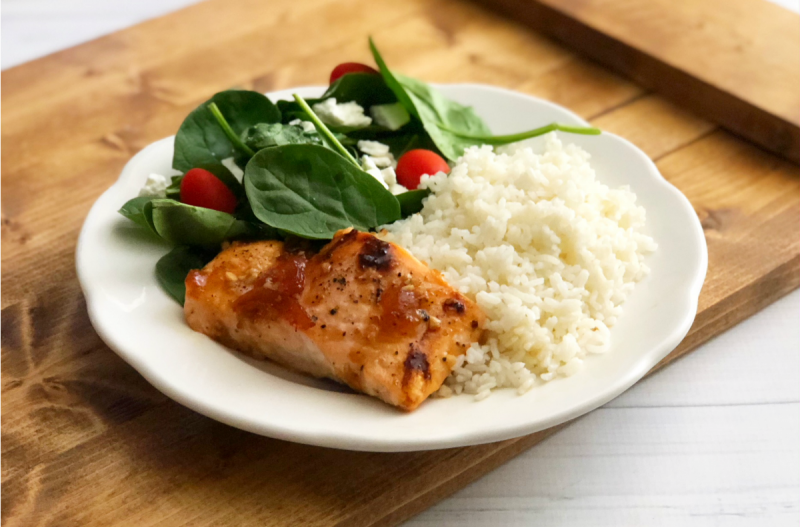 Serve Soy Citrus Salmon with side of rice and salad. In a small mixing bowl, combine 6 Tbsp orange marmalade, 6 Tbsp lime juice, 4 Tbsp soy sauce, 2 tsp rice wine vinegar, and 2 tsp minced garlic. Put baggie in the freezer and freeze up to 6 months in fridge freezer or 12 months in a deep freezer. Thaw in the fridge overnight, or a warm bowl of water for about 20 minutes, before transferring the salmon, glaze and toppings to baking dish. Bake at 400 F/200 C for 15 to 20 minutes, or until salmon is no longer pink. Thaw completely, then bake at 400 F/200 C for 15 to 20 minutes, or until salmon is no longer pink in the middle.